The dry season is upon once again and hence the electricity will probably a little sporadic for the next few months. At least we can write a little on the blog as long as the battery lasts. I bought an African type moo-moo today for relaxing around the apartment and already am putting it to good use as the electricity is off at the present time. I think we should take turns fanning each other tonight! We have tried to help as many people as we can who have medical problems, and this week has been busy with clinic runs and helping with medications. Godwin, the young man who just got his mission call, has not been feeling well. We took him to a clinic and he was diagnosed with high blood sugar problems. He is pretty much on an involuntary meal restriction diet except when he eats with us, and the doctors told him he needed to eat regular well-balanced meals. We are going to help him so he can eat a little better as I think he has been eating gari and sugar most of the time. For 25 cfa’s (5 cents worth) mixed with sugar you have enough to fill your stomach but has absolutely no nutritional value. Soeur Estelle is home recuperating from what the doctors say is a liver problem, and we have checked on her. Last week we took her to the doctor and to the hospital for tests. He told her to eat only fruits with a few vegetables and nothing else. 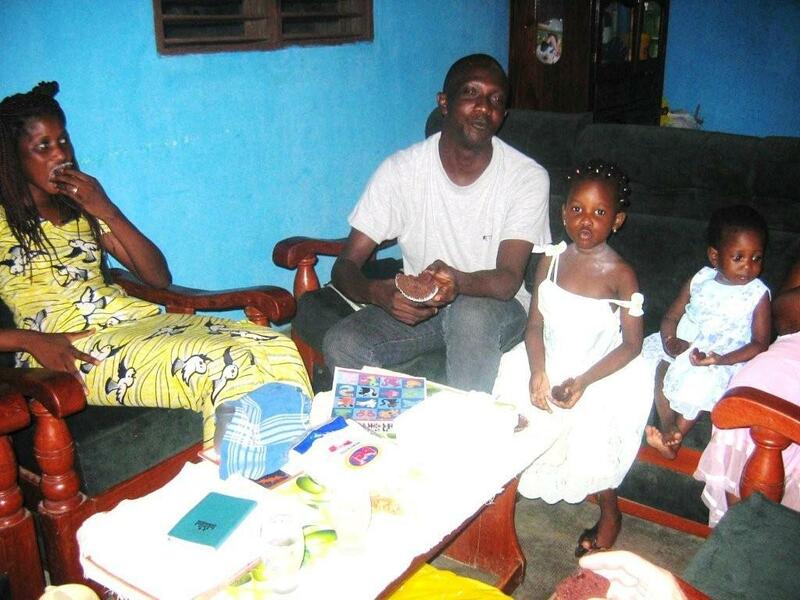 After visiting her we headed for Porto Novo where Frere Landu, our branch piano teacher, had reported in sick. He was doing a little better, but we took him shopping for some food and got him situated a little. I guess he has Malaria but he was to Church today and feeling a lot better. On our way to Porto Novo we passed a pond where Muslim goats were being washed. I commented on how they were being cleaned just to be a sacrificial goat. We went a little further down the road and there was a goat fair in process, quite similar to the San Juan County Junior Livestock Auction. Freshly scrubbed goats were everywhere and many Muslim men wandering around looking at them. The goats we see on the streets don’t look that good. You may wonder how you distinguish a Muslim goat from an infidel goat. The Muslim goats are big and ugly with horns that grow more to the side than straight up off the head. Many of the big male goats end up being sacrificed for special occasions. Our neighbors who live below our apartment are Muslims and are very good neighbors. He is the counselor from the country of Niger, and one of his homes is here and the other one is a few blocks away. 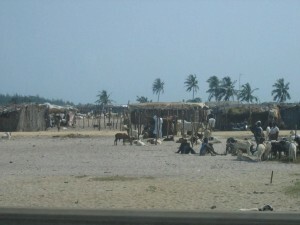 Benin is about 30% Muslim, and they are very peaceful people. They have large mosques in every neighborhood. The men are called to prayer about five times a day and all over town you see men washing their feet and faces before praying on a mat facing east. 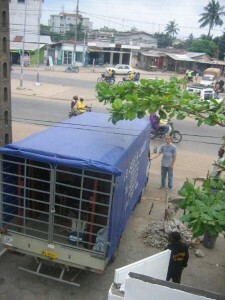 Not long ago we came home one day and a huge celebration tent was being put up in front of our apartment. Our neighbor came up twice to ask if it was OK with us to have the celebration in front of the apartment, as there would be some music. He explained that the occasion was to give his baby a name. When we went to church sure enough there were two goats waiting patiently to be sacrificed and when we came home the deed had been done and they were processing the goats. They did have music and food but the festivities never did get objectionable. Monday turned into an interesting day. After the usual P day shopping for and with the elders etc., we had an appointment to have a family home evening with Soeur Pascaline and her family in Akpakpa. 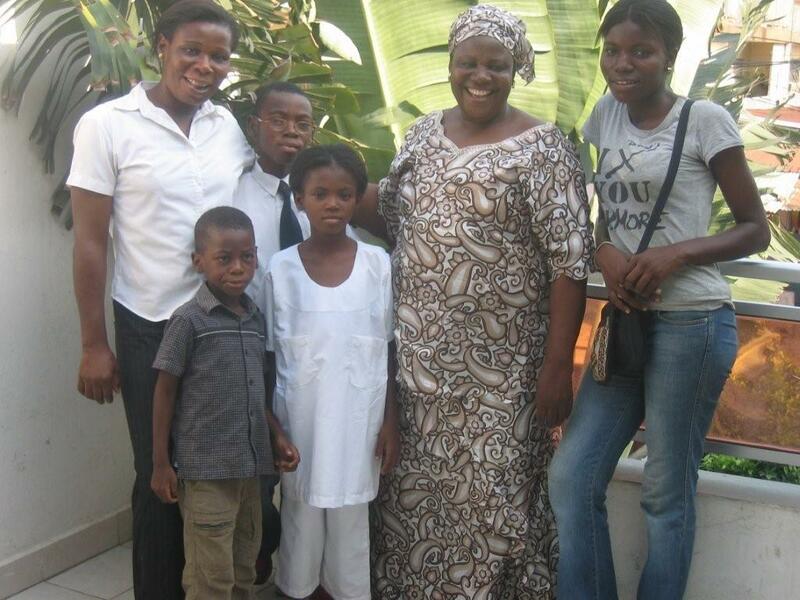 Soeur Pascaline is the Primary President in the branch and has 3 daughters, Nancy, Queen and Unice. The three girls go to a Nigerian school and speak English but are also fluent in French and Fon. 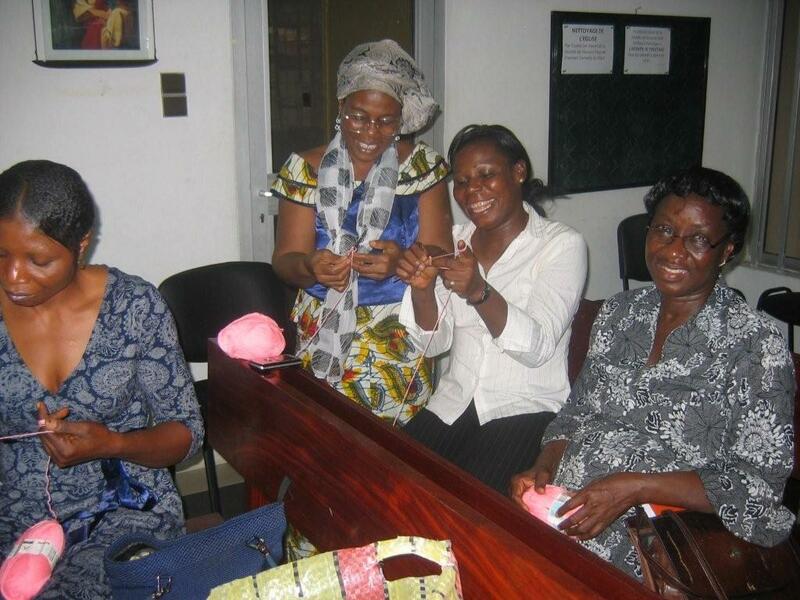 Mama Pascaline is a French and Fon speaker. All that is pretty easy but the home they live in is a family home and there are always a number of other people there whom you have no idea who they are. To make matters worse, the power went off in the early afternoon and by 7:00 when we were supposed to be there it was dark as in DARK. 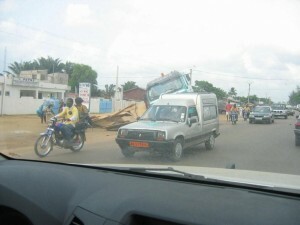 We made our way to Akpakpa in a monster traffic jam with no traffic lights and managed to find the house. Inside there were two little candles burning. It was a dark house on a dark street in a dark city with dark people, and even dark cupcakes prepared by Soeur Black. Knowing the situation, she took a lot. We were hoping for a quick lesson, activity, refreshments and then escape to our pickup and come home, but Soeur Pascaline insisted we eat also and disappeared into the darkness. About a half hour later, we were eating rice (that we could recognize) with some sauce etc. but with no way to see what we were eating. 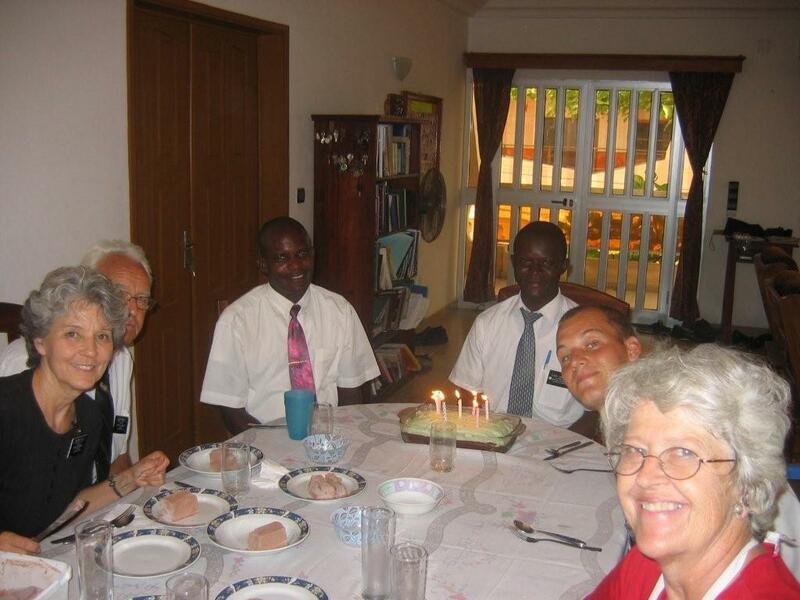 Soeur Pascaline wanted to be sure we got plenty of the pieces of meat in the sauce so dished ours up accordingly. Soeur Black immediately became suspicious and sneaked hers into a sack in the darkness but I chewed mine as best I could. I think we would have been just fine if Soeur Black hadn’t brought hers home and examined the intestine in the light. Actually it’s not too bad if you can’t see what you are eating and you have tough jaws with which to chew. I could tell my next to the last bite was a vegetable of some sort so I just picked it up and ate it. Turns out it was a whole piment (a hot African pepper). By comparison, jalapeño peppers are quite mild. There isn’t any way to politely spit out a pepper once you have started to chew it even in the dark so I just had to eat it. It was already hot in the room and by the time I chewed the pepper I was sweating profusely. I did have one bite left to perhaps tone it down a little but – you guessed it – a piece of meat. Then I begged Soeur Black for a cupcake but there was only 2 left and she was afraid more people might come so she wouldn’t give me one. I can’t even express how glad I was to get back out into the warm dark night air of Cotonou. We did have a good home evening though. We showed a film on the birth of Christ and talked about the meaning of Christmas and left them with a scripture list for the 12 spiritual days of Christmas. We had to explain what the 12 days of Christmas was however. Sometimes it just comes home really forcefully that we have changed cultures. We still aren’t sure who all the people were that were there. Yesterday, Saturday November 29, we went to the Benin-Togo border to get Elder Howard as he is being transferred to Cote d’ Iviore next week. 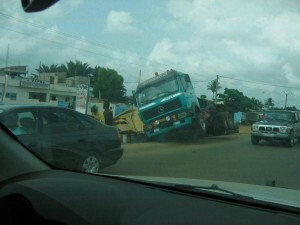 He was unable to get a visa in Togo but we can in Benin. There is a little strip of land at the border where both countries have their customs offices. It is almost impossible to describe and no pictures are allowed. There are cars and trucks parked everywhere waiting for proper papers, people walking both ways and many beggars and sellers and a few thieves. It is CHAOS in my estimation. 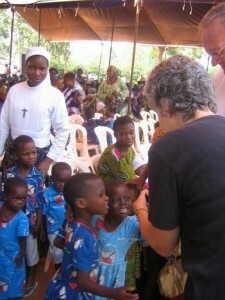 After we arrived and met Elder and Sister Gillis and Elder Howard, we were immediately surrounded by people selling watches, tee-shirts, snacks, etc. 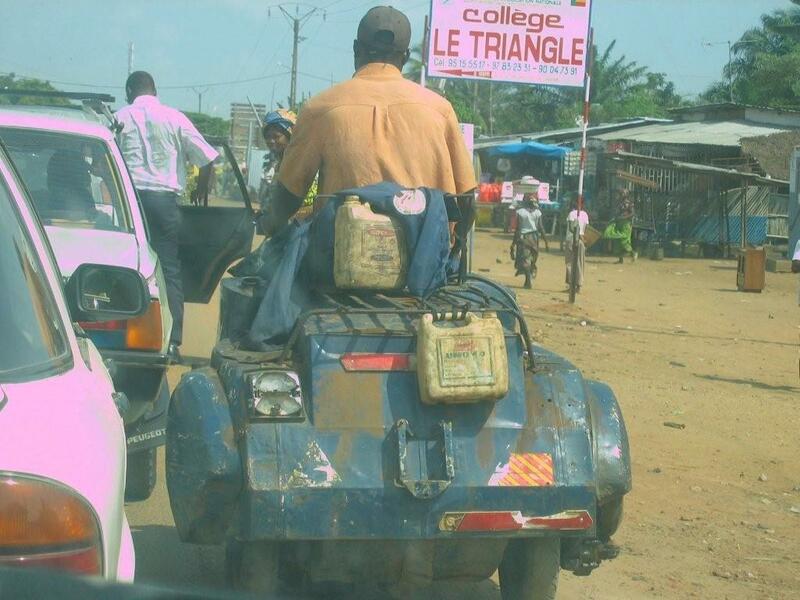 The first beggar was a young man in a three-wheeled bike you sit in and peddle with your hands. Just as we were leaving a young boy came begging with a blind old man and wanted a cadeaux (gift). I handed him a chocolate cupcake, and he looked at it in the funniest way and then as we were leaving, I looked back and the young boy, old man the watch seller were all examining it and finally the watch seller pinched off a little morsel and tasted it and had the funniest look on his face. That definitely was not the gift they were looking for! Today the sacrament meeting was put on by the Primary kids. I think we could challenge any primary in the church to a singing contest with our 20 or so primary kids. It was wonderful and all of the parts were perfect. It really made us feel like there is hope for Africa. There were 177 people there. The building just won’t hold any more. Hopefully the branch division will come soon. We are going to include a few pictures that Soeur Black took going to and coming from the border. 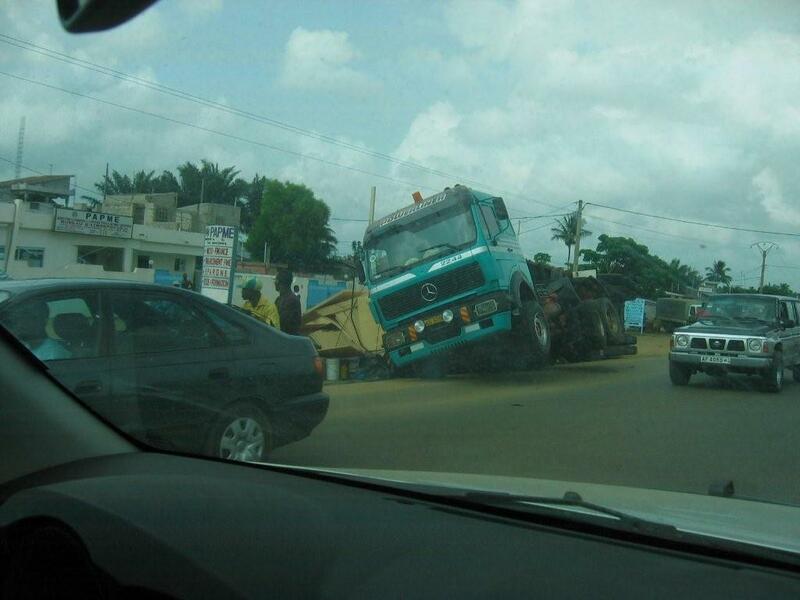 Maybe we will talk about driving on Benin roads another time but this might give you some idea. It is about the only pictures we got for the week. Sorry. Maybe we can do better next week. Is this a scooter, a car, what? Soeur Black and I have finally become celebrities here in Benin. Maybe not really celebrities but we did make the 8 o’clock news. Last Monday was the kickoff for the measles vaccination campaign in which we have been somewhat involved along with Elder and Sister Findlay. They prevailed upon us to go with them to Allada, a town about 40 kilometers away, where the kickoff ceremony was to be held. 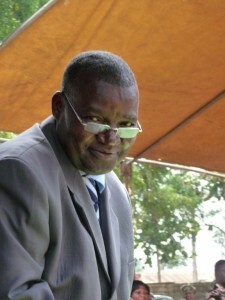 When we arrived they seated us on the stand right next to the Minister of Health. All of the news media was there, and our white faces seemed to draw quite a bit of attention. I think we even got more coverage than the minister himself. 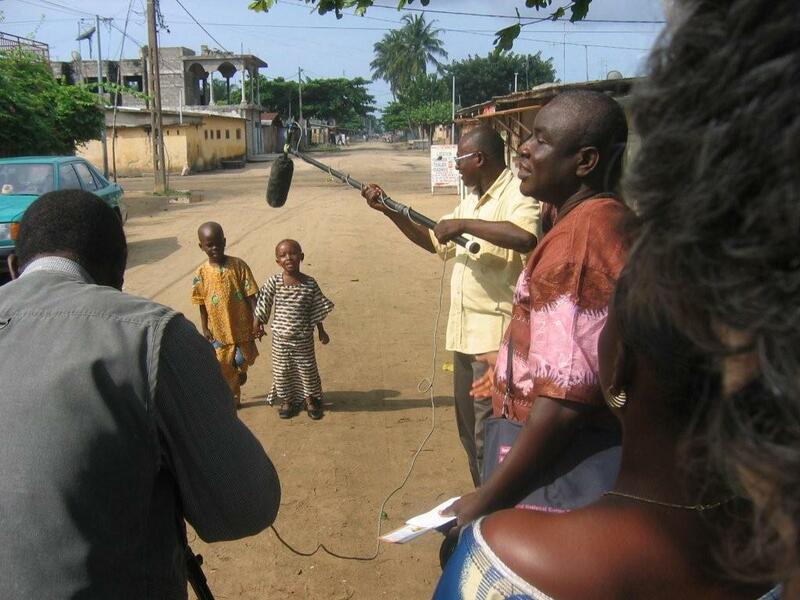 On Tuesday we went over to Lokossou’s and watched ourselves on the news along with a lot of other coverage about the measles campaign. Since then a lot of the members have commented that they saw us on TV. Also a lot of them have seen the advertising spot on TV or heard the one on the radio. 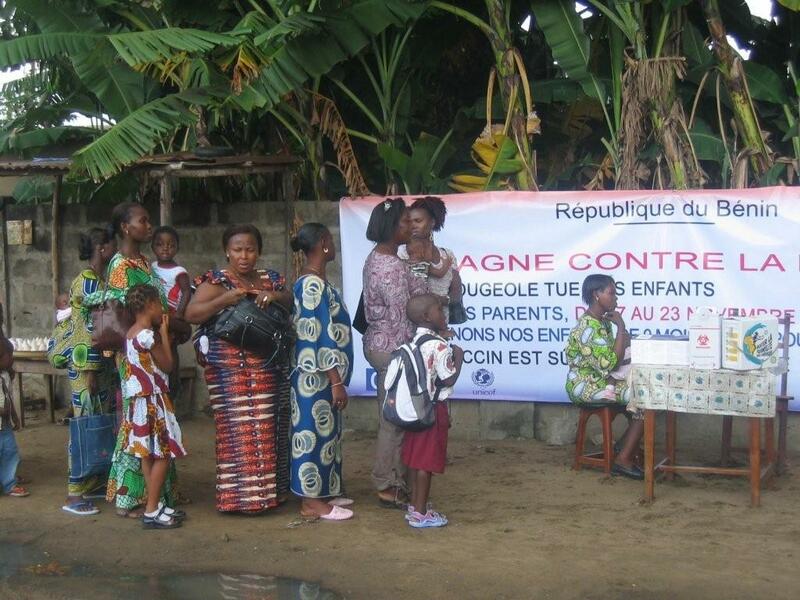 The campaign is supposed to be finishing up today (Sunday) so we hope it was successful in getting a lot of children vaccinated. 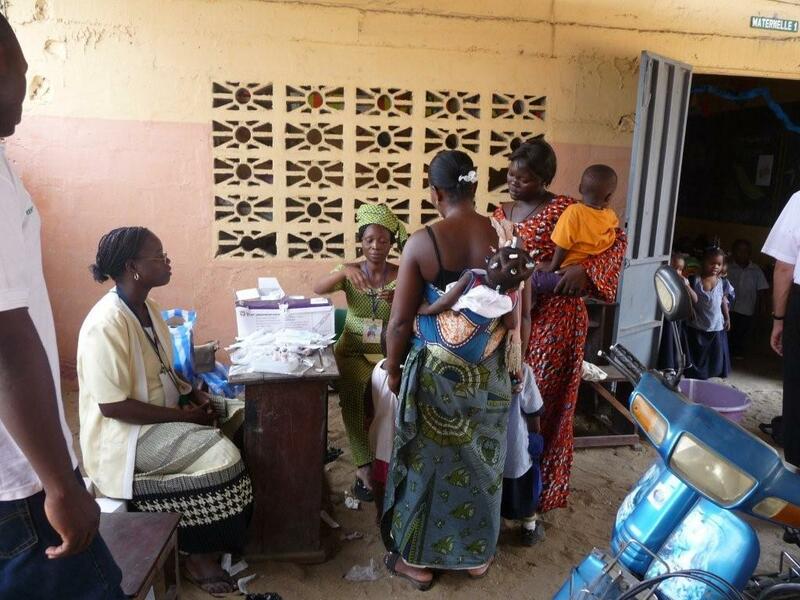 As stated before, the campaign is actually carried out by the ministry of health in little clinics and under shade trees all over Benin. We got a lot of good pictures of this event as opposed to all of the “eating” pictures of last week so we have a little more to offer this week in that department. The Findlays left on Wednesday and are now enjoying a nice 3 week vacation in Egypt before returning to Canada in time for Christmas. It made us just a little homesick to see them finish up and be headed for home but only for a while. There is plenty to do and our turn to return home will come later. 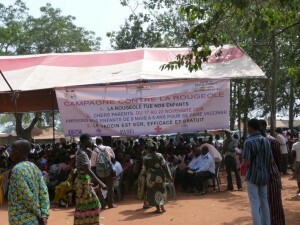 The opening ceremony for the measles campaign took place at the local Ministry of Health facility, and when we arrived there were already about 1000 people there all seated under two large portable tents. Many of them had kids on their laps as actual vaccinations were going to be given after the ceremony. The front rows were filled with cute little kids from a Catholic school. They did get very serious though when the vaccination process began. They were also given a little drink of vitamin A. We also met a couple from Canada who had five kids there between the ages of 9 months and five years who were from a little orphanage. The couple represented a Bible group and were here for a few weeks helping in the orphanage. It is wonderful to meet folks who are dedicated to helping make a difference in this world. Last Saturday we had a baptism for a little member girl, Faveur Dike. Faveur is a very smart and special little girl. Her mother, Precious, has been a member just a year now and went to the temple last month for the first time. They are a really good family. Mama Dike (Victoria) has just opened a little store where she sells basic items to neighborhood folks. Her husband is in Nigeria and only comes over once in a while. 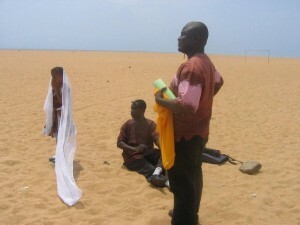 He wants to be baptized also but hasn’t been here enough, and in Nigeria he is a long way away from a ward or a branch. Since they are from Nigeria, they are English speakers. Soeur Black took some of her now famous chocolate cup cakes over on Saturday and then Faveur asked me to confirm her on Sunday so all in all it was a good experience. We would like to have had some convert baptisms also, but the missionaries are teaching some really good people right now and that will come later. 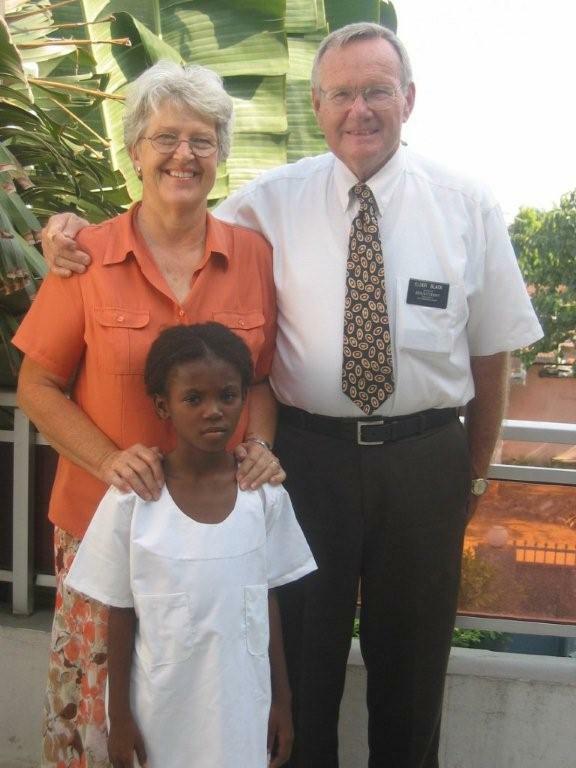 We have talked before about Godwin who was waiting for his mission call. Well, it finally arrived on Tuesday and he is going to the Cote d’Ivoire Mission and will enter the MTC in Tema, Ghana on January 23. 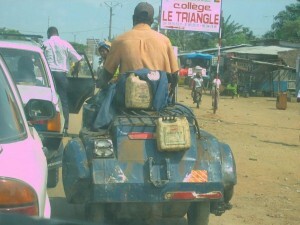 He was born in Togo, and it has taken much time and many trips to Togo for him to get his passport. Perseverance paid off, and he finally has his passport in hand. I think that he was pleased with the call as his good friend Elvis is there and he did not have to go to Congo or Nigeria where he was afraid he might be called. He told us previously that he did not want to go to either of those countries. I told him that originally I did not want to go to Africa but now that I am here I am no longer fearful. He will be a good missionary, and we are excited about his willingness to serve. 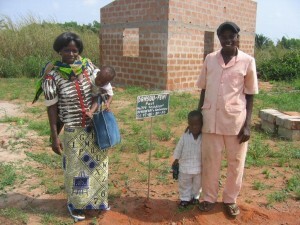 Paul and Honorine Dansou are very faithful members of the branch. They are another couple who were recently married civilly and then went on to be sealed in the temple. Paul is the branch clerk and seems to be involved in everything. He and Honorine bought a piece of property outside Cotonou and have started building a small house on it. We drove out there with them on Thursday to see what they had done. It is located in a very quiet and peaceful neighborhood out in the country. The biggest problem they will encounter is the distance from Cotonou. Paul is a welder and plans on continuing his work here and of course the church is here. It took us 45 minutes to drive from his house to his existing home. You will notice from the picture this is a very small home with only two rooms – a living room and a bedroom. The kitchen and shower will be outside in back of the house. There is a well in front and room for a big garden. We couldn’t help but notice the contrast between our big homes in Blanding and the small structure Paul and Honorine are building. It does not take much to make the people here happy and content. Kids sleep on mats on the floor and many times so do the parents. The kitchen consists of a charcoal burner or two outside on the ground and a couple aluminum pans. The sink is two large pans for washing and rinsing the dishes, which are very minimal as many times all they need is a plate as food is sometimes eaten with the hands. Paul needs to be out of his current rented house by January, and we asked what it would take to finish up his house. For about $700.00 he could move in and for another $300.00 he could finish it up. Pretty unbelievable, isn’t it? 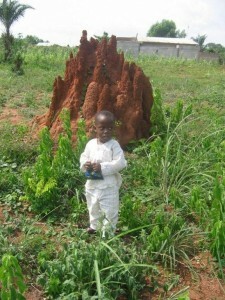 Next to his house we passed a large termite mound which I am glad that we never see at home. There is probably a reason why they build houses over here out of cement and brick and not out of wood. The first thing they did on the property was to dig a large well, probably about 3 – 4 feet in diameter. The water is down probably 50 feet or so. A bucket on a rope will provide the water supply. The dirt from the well was used to make the blocks from which the house is built on site. If they decide to put power into the house it comes basically via extension cord from the neighbors a quarter mile or so away. A lot of the homes out like that don’t have power as electricity increases the cost of living. For a lot of families that presents a problem as it is important to minimize costs. We can’t blame Paul and Honorine for wanting to move out of town. I think we did the same thing a few years back, and Blanding is a whole lot smaller and less crowded than Cotonou. When Soeur Black made the cakes for the weddings a few weeks ago, the wife of Brother Lokossou, the first counselor in the branch presidency, was in China. She is a business woman and goes to China fairly often to buy goods, which she imports and resells in Africa. Lucy is not a member of the Church. Brother Lokossou really enjoyed the cake and asked Soeur Black if she would be willing to teach Lucy how to make that kind of cake. We have been looking for a chance ever since to invite them over to the house, so on Monday instead of our usual home evening with a family in the Branch we decided to invite them over to a cake-making event and dinner. Brother Lokossou is about our age and Lucy is a little younger. They have been married for over 30 years. Both have children, although they have none together. I guess all the children grew up together and count each other as brothers and sisters. Most of them live in France now. We had a wonderful time–told a lot of stories and had a lot of laughs. It was really fun to get to know them better. Brother Lokossou is a retired banker and gives us a lot of help with apartments and general advice on how to handle things. One of his brothers, along with his wife and family, are also members of the church so there are a lot of Lokossous in the branch. Most of the rest of our week has been taken by another visit from President Ayekoue. Elder and Sister Gillis from Togo brought him over on Thursday morning and stayed until Saturday. We had planned their visit since they know the Findlays and the Findlays are also here for their final stay before returning home. The Gillis’ and Findlays both stayed at a little hotel not too far from the house and President Ayekoue has been staying here with us so we have had four adult couples for a few days minus Sister Ayekoue who is still recovering from a broken ankle and was unable to come this trip. As we had the branch conference in addition to the zone conference, the President’s stay has been a little longer this round. We will put him on the airplane on Monday morning to go back to Ivory Coast. Soeur Black fixed a nice dinner on Thursday for everyone and then we had our zone conference with all the elders here at the apartment afterwards. Findlays and Gillis’ went around town to see some of the sights while that was in progress. 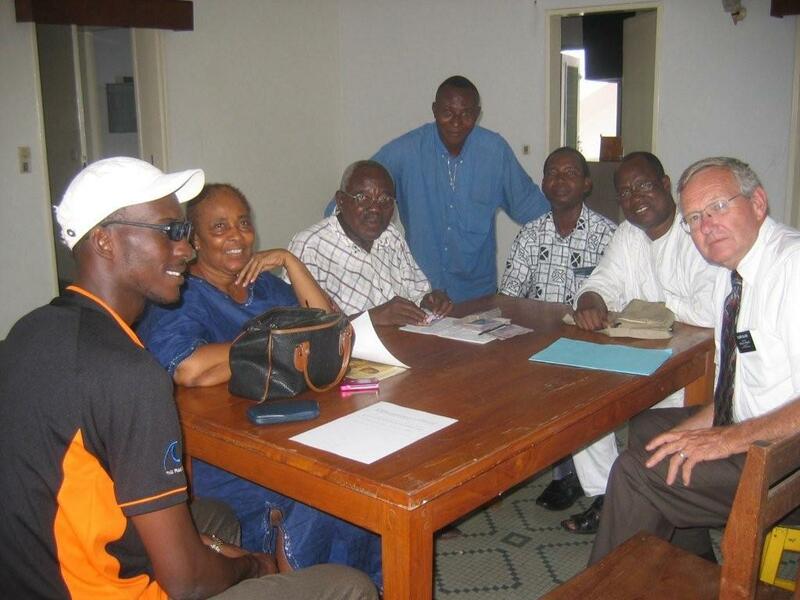 On Friday, President Ayekoue interviewed the missionaries and then had a little meeting with us and the Gillis’ on the state of things here and in Togo, after which we all went out to a nice dinner. The last week when the Findlays were here we went to eat at a nice little restaurant that professes to be an oriental restaurant. 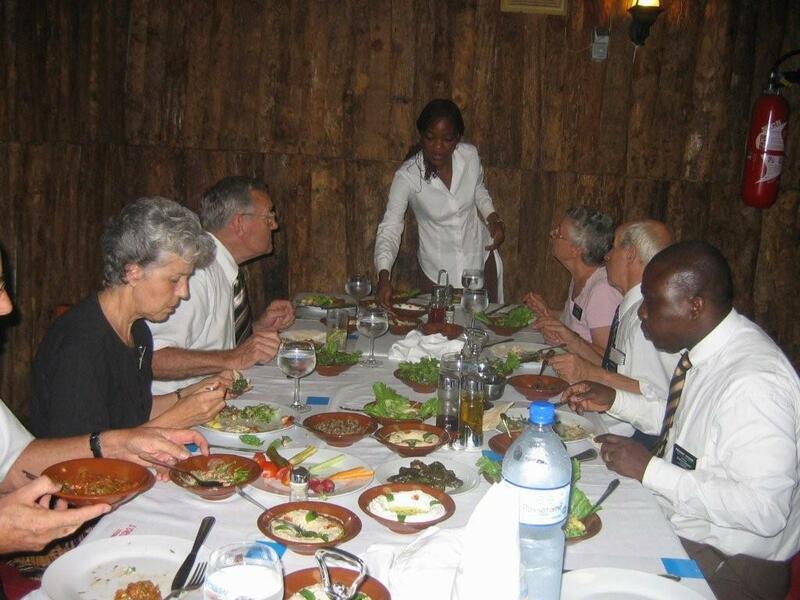 Actually they pretty much cater to the Lebanese people and offer what is called a “Mezzo.” Seems like quite a few Lebanese people live here in Benin and are the shopkeepers etc. 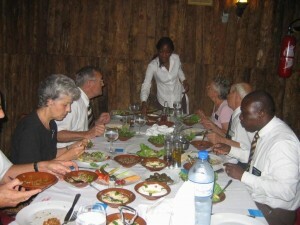 We were quite impressed so we took the Gillis’ and President Ayekoue back there for a rerun of the “Mezzo.” It is a collection of 25 different dishes of Lebanese food. Some of it is a little strange, but most is really good and we did not go away hungry. Maybe Soeur Black will have to describe some of the plates later. For me it was just a great meal. They give us our own private dining room also, so we had a really nice time visiting and enjoying the evening with good friends and good food. On Saturday, we had engineered a meeting between President Ayekoue and the landlord of the Akpakpa building. They had invited us out to their house to sign the copy of the contract with all of the dates corrected and everything in place. We cheerfully accepted the invitation to get to know them a little better. The Agboton’s are a very nice older couple. They are quite wealthy by African standards, maybe even by western standards, and live in a very nice home in an exclusive area. We had an enjoyable meeting with them, signed the contract, and told them a little about the church. They are quite interested and want to come to a meeting as soon as we get moved into their house. President Ayekoue says that will probably be about January before we have the approval to divide the Branch. They seem to be thrilled that we are renting their house and are going to use it as a church. Quite a different experience from the Muslim man who couldn’t allow his property to used for Church. During the week, we had heard a rumor that some of the members had planned to decorate the chapel and have everyone wear white to the Branch Conference. We weren’t quite sure just what to do. There isn’t a graceful way to call someone and ask what they are going to wear to branch conference. On Saturday morning I went over to the church. The members were there cleaning, and I saw no signs of decorations so we decided it was just a rumor. When President Ayekoue and I walked over to begin the afternoon interviews – BALLONS EVERYWHERE. 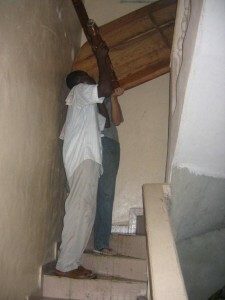 With the help of some missionaries we managed to get them out of the chapel and tied them down in the entry way, which pretty much serves as our cultural hall. Then we found out that refreshments were planned for all the meetings also. It was too late to head that off for the evening meeting but President Ayekoue did get most of it stopped for the conference itself today – no drinks, just sandwiches handed out after meetings. I guess they were already made and he didn’t want to hurt any feelings. 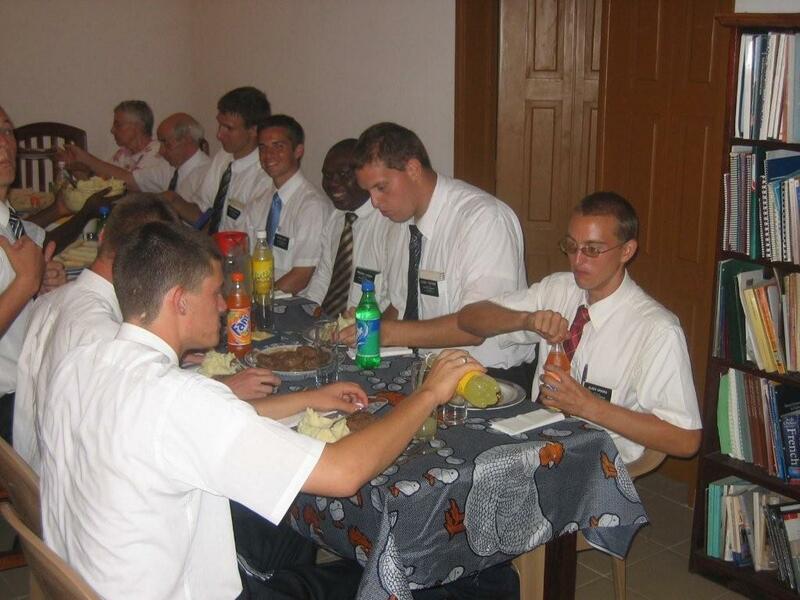 There was a lot of white in sacrament meeting today but also some pretty African dresses so it wasn’t too noticeable. It turned out to be a really good conference. 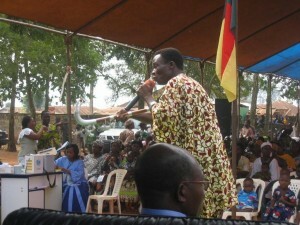 President Ayekoue did a lot of good training and some other talks were really good. Soeur Black and Soeur Findlay were supposed to do some training in the Relief Society portion of the meeting on Saturday but the meeting was late starting and their time was taken up by others so they had to quit about as soon as they got started. I suppose I have to accept part of the blame for the decorations etc. Since this is our first ever branch conference, I had talked it up quite a bit and tried to give the branch leaders the impression that is was important, which it is. I guess the translation of that into African culture is that if it is important it is worth have decorations and refreshments. It is just really nice to have a mission president who can give some training and help local leaders in their own language with no accent. President Ayekoue is a terrific speaker and knows the gospel as well as anyone. Probably we will see him as a general authority one day. That kind of leadership is having a huge impact on our little branch and will pay great dividends in the future as the church continues to grow here in Benin. We are really getting some good solid people who are capable leaders in the Branch and we can see great progress just in the short time we have been here. We also seem to be making a few inroads in working with the wives of some of the branch leaders. In addition to making good friends with the Lokossou’s, Pierre’s wife has been coming to church and now has a baptismal date set. Also the Elders quorum president’s wife, Helen Briga has been coming to church ever since we had the family home evening with them a couple of weeks ago. 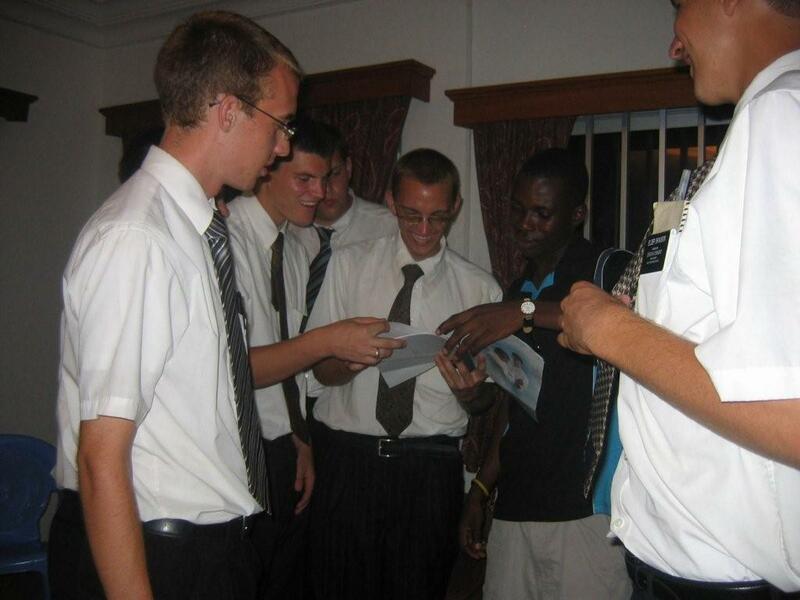 In addition, there are a number of other family members of some of the branch members who are being taught by the missionaries right now. 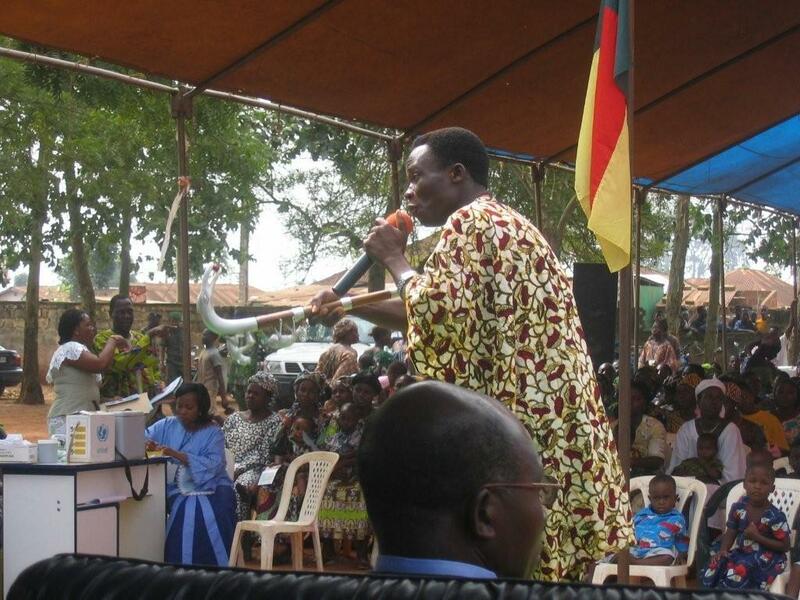 There seems to be a good spirit, and the church is growing in Benin. Looks like all of our pictures this week are eating pictures. Maybe that is because we have basically been eating all week. It has been a good week for food. No weight loss this week. The big news this week comes from your side of the ocean where Steve successfully defended his doctoral dissertation. We are proud of all of our children and their spouses and their accomplishments. Thanks for all of the hard work. 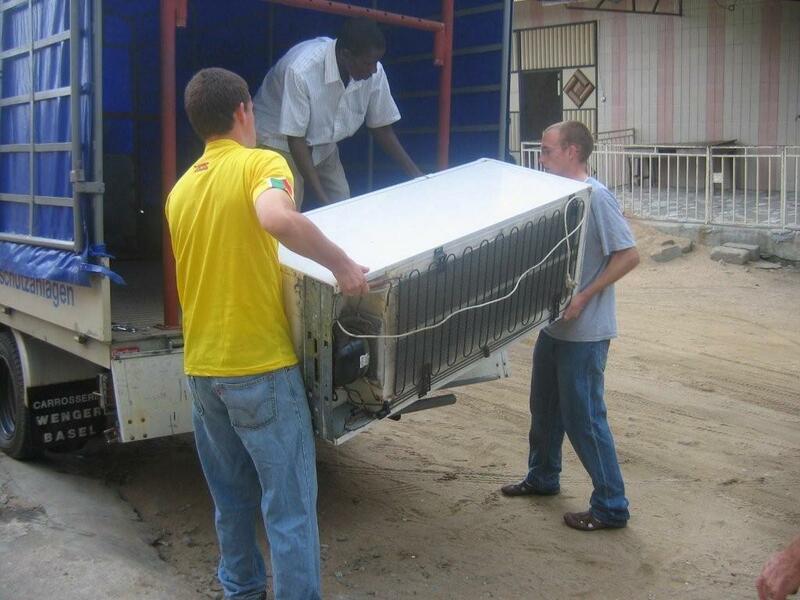 It is amazing the things you can get into when serving a mission in Africa. This week it was TV production. We have mentioned before that the Findlays are here working on a measles campaign. 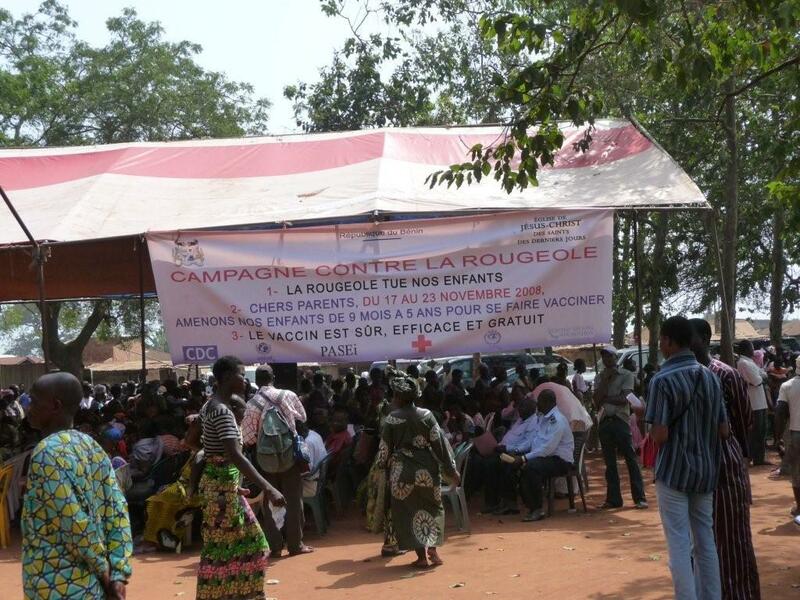 The role of the Church is to join in the campaign sponsored by the Benin Ministry of Health and UNICEF (United Nations) by providing the advertising for the campaign. It is one of the Humanitarian outreach programs of the church. Elder and Sister Findlay have been busy getting 160 huge banners (probably about 4 feet by 20 feet) made that will be put up all over Benin. There is also printing of brochures and volunteer badges and making television and radio advertisements. 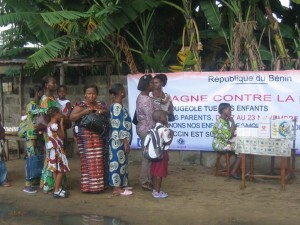 The goal is to get every child in Benin between the ages of 6 months and 5 years vaccinated against measles. The return for the Church is that everything printed has the church logo on it so a lot of positive publicity is generated. We also rounded up member kids and their parents to do the shooting of the TV commercial which was done on Wednesday. Sister Black and I were assigned to pick up the TV filming crew and chauffeur them around to the various filming sites. The stars of the show were two 5-year-olds from the Branch. Cecelia and Regis had to hold hand and say in French “a child vaccinated is a child better immunized.” “Immunized” in French is very similar to English and is a real mouthful for 5 year olds. It came out more like “minimized.” The TV filming crew probably had them say that 100 or more times before they started to get it right and even then it was a little questionable. On the way back to the studio, they were laughing and talking about how they really should put in one where they said it wrong because it was so cute. After filming that they went to a little maternal school (we would call it a preschool) right by the chapel and filmed some of the kids there with all the other kids playing etc. Then on to a nearby clinic where they actually brought out a table and immunized some of the kids. The parents and the children just had to stand in a line waiting for their turn. After that they went to another hospital and actually filmed some kids who were really sick – not with measles, but with other things. The next take required a little effort to find a good place as they wanted a rather traditional African home. There just wasn’t a place at the chapel that would do so we finally ended up going to the member’s home who was playing the part. 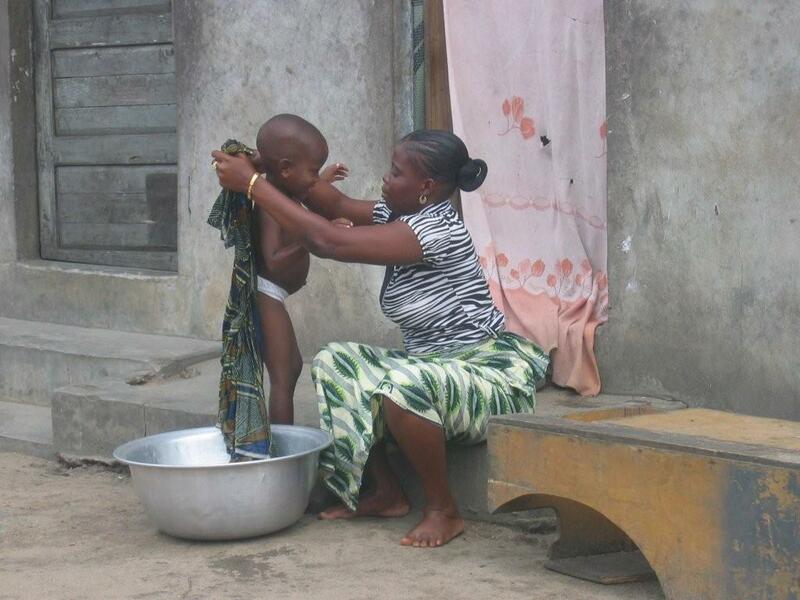 There the mother had to wrap a cloth soaked in cool water (as cool as water gets over here) around her little child in order to try to lower a fever. I guess that is what they do when a child has a fever here. Last stop was at the beach where an older (but small) girl, Unice, played the part of a girl just reflecting on the situation. 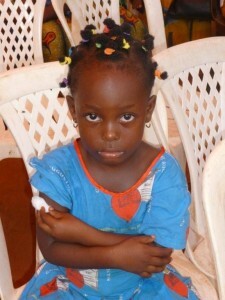 Unice is about 8 and is an amazing little girl. She speaks 3 languages–English, French and Fon–all with native fluency. The filming crew worked with her for probably an hour getting the scene just right, and she played the part just like a star. All in all, it was a lot of fun and we are anxious to see the final product. Each child who participated will get a DVD of the TV spot as a souvenir. 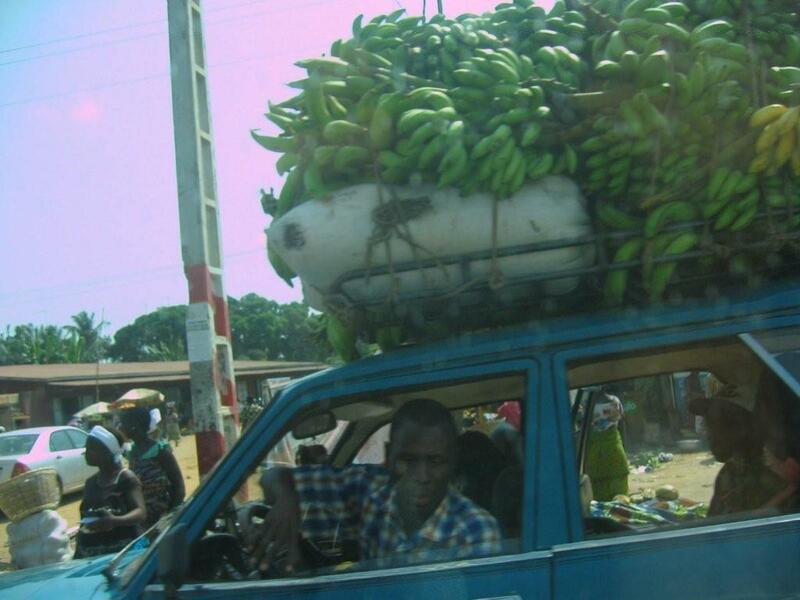 Meanwhile, back at the mission, we have been keeping busy solving money problems that always seem to crop up when you try to do anything in Africa. I think the bank likes to hold on to the money and make interest when it is transferred so they tend to tell you for a couple of days that the transfer has been made when in fact it hasn’t if the money is going out of the account or that it hasn’t arrive yet, when it in fact has if money is coming into the account. There have been so many things in progress all at the same time, getting things in their proper place has been difficult. First of all there was the chapel rent we talked about last week that finally got paid. In addition to that we were renting an elders’ apartment on which the rent had to be paid for a year in advance and then all of the money for the measles things and needing to get those bills paid. Anyway, we think we have finally caught everything up without any major mishaps, and we were able to get the elders’ apartment in Akpakpa rented on Friday. The elders will live on the top floor, and there is room on the bottom floor for the Akpakpa Branch as soon as we get the branch divided so we are making progress. 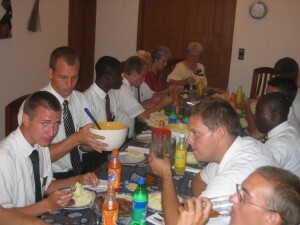 We invite each elder and his companion over for dinner on his birthday. Sunday was Elder Samutamu’s twenty-fifth birthday so we had reason to celebrate. He had no requests other than he really did not like hot piment so we just had a good American meal and chocolate cake. After dinner we took the elders out to Akpakpa and he said it was the first time in his life anyone had ever baked him a cake. He was genuinely pleased, and it was an honor to make it for him.